I’m a new quilter, but I already believe that each quilt has something to say. Sometimes it’s something in the fabric or design that spells out your hopes for its new owner, like a gift to a new baby or a young married couple that wishes them a long, happy life together. I had intended this to be a baby quilt. 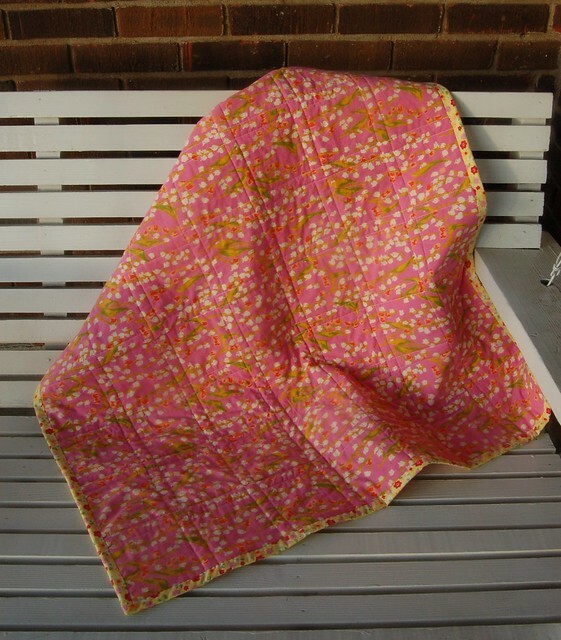 But while I was sewing it, I thought about a friend so strongly that if felt as if the quilt decided it wanted to go live with her. She’s got cancer, and she’s really fighting to regain her health. Yet she’s celebrating each move forward, no matter how small. 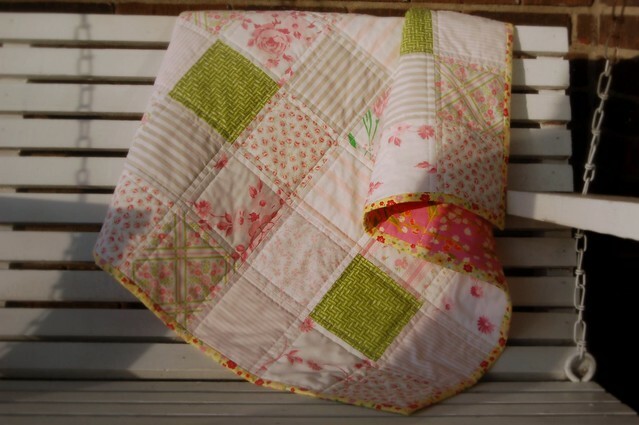 I wanted to send her a bit of comfort, and this little quilt wanted to be it. It’s made of vintage linens, sheets that someone else had grown tired of and sent to the thrift shop. After years of being laundered, they’re amazingly soft, and the pinks and greens seem sweetly old fashioned and current all at once. 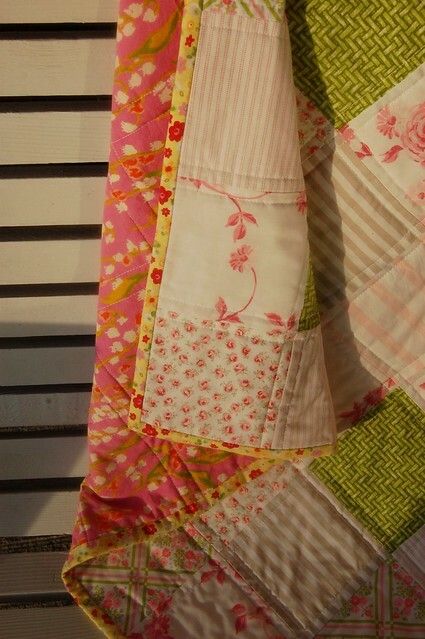 As I said, I’m new to quilting, and it wasn’t until after I’d already started this upcycled quilt that I read about how sheets aren’t to be used in quilts. Something about the higher thread count’s tighter weave being harder on the thread than a quilting weight cotton fabric. I’m hoping the hundreds of washings will negate any issues there. So now it’s a lap quilt instead of a baby quilt. It’s like a wish that she’ll be able to roll with the changes thrown at her as she heals. It’s little and imperfect, but I bet it will still make her smile. Perfection is so overrated. It shouldn’t even be here, as sheets aren’t supposed to be used in quilts. Pffftt, says the little pink quilt. Don’t get stuck in other people’s rules. And don’t ever feel “done”. Maybe you’re just being remade. I hope it lets her know that she’s cared about by more people than she probably realizes. I hope she feels warm and cozy while she heals. And I hope she can hear the quilt whisper that she’s beautiful, and that they they both have a lot of life left yet. wow its really beautiful! I bet your friend will be so encouraged! Thank you, I hope she will be! I was just glad to think of something that might raise her spirits. Its lovely, and yes gifts made with love have such good energy in them. Those fabrics are beautiful, I’ve never seen such nice sheets in my op shops. Thank you, lore! I bought a lot of the vintage fabrics from WhimsieDots because I couldn’t find enough of what I wanted locally either. She sells little bundles in different colors and themes, really helps! oh no ! another etsy shop to add to my favourites!! Pingback: Kelley Koehler » pfft.